Kenyon's 2006 teaching award winners give credit to their own inspiring teachers. One thing great teachers seem to have in common is that they studied with great teachers themselves. That's certainly the case for Theodore O. Mason Jr. and Wade H. Powell, the winners of this year's Trustee Teaching Excellence Awards. Mason, a member of the English faculty since 1988, can recall a fifth-grade teacher who taught him the value of high expectations. Powell, who joined the biology faculty in 2000, traces a line of inspiring teachers in his life from a postdoctoral mentor at the Woods Hole Oceanographic Institution all the way back to his father, a physicist. 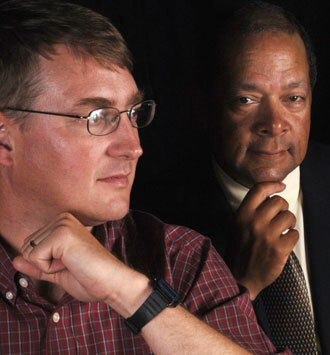 In brief question-and-answer sessions, the Bulletin asked Mason and Powell to reflect on the paths that led them to teaching, and on the pleasures of their profession. I can't pinpoint one specific moment, but I can point to something that happens each semester. At some point, the students in the course "get it." They finally see, not so much the idea you've been thinking about, but rather the process of rigorous thinking you've been wanting them to undertake. And they do it on their own, because it makes sense to them to do so, not because you have made them do so. All of a sudden, issues, ideas, and problems start opening up to them. They begin working with the intellectual tools you've been considering as a group. What have you learned about teaching since coming to Kenyon? I'm certain that one of the things I've learned is the value of intellectual flexibility. My own thinking and teaching have changed greatly over the years. One of the best things that can happen to any teacher is to discover the need to rework what we do. It's not that you reinvent yourself; rather, you have an awareness of your own intellectual development. However I have developed and improved in these last years is directly related to the lessons I learned from other instructors, especially those outside the humanities. This is difficult to say. I remember having a set of excellent teachers throughout high school and college. I loved reading literature and loved thinking, talking, and writing about it as well. In both high school and college [at Wesleyan University] I was lucky enough to be in relatively small classes, the kind we teach here. It must have occurred to me that being lucky enough to do what my teachers did for a living would be a pretty nice job. There are many things that thinking about literature enables you to discuss--history, philosophy, religion, politics, psychology. But to do that effectively, you need to like literature as a pursuit in itself. Who was your own favorite teacher, and how did that person influence you? I've had lots of favorite teachers. Miss Marshall in fifth grade taught me that having high expectations was a good thing. George Starr and John Vargo in high school got me interested in literature. Richard Slotkin at Wesleyan University and Arnold Rampersad at Stanford [where Mason earned his Ph.D.] both helped me think about teaching as craft, as did Stanford's Lucio Ruotolo and George Dekker. What do you like best about teaching at Kenyon? The atmosphere of the small liberal arts college is one of the things that brought me here. I like the contact with students and the sense of exploring an idea as a group. I'm perfectly capable of lecturing every minute of every class period. But, having done that already, I knew it wasn't a form of pedagogy I really liked at all. What about the advantages and disadvantages of being in a place as small as Gambier? People speak of the Gambier "bubble." I don't think the bubble is necessarily a bad thing, but you need to find ways of getting away--a conference here and there, some consulting work, perhaps. I was thinking the other day about David Foster Wallace's Commencement address from 2005, the burden of which was, as I recall, to remember that it's not all about you. Finding ways of learning about and imagining other lives, other kinds of lives, helps get one out of the bubble. What do you do to relax? What's your release valve? I like to work out. I listen to music all the time. And I really like coaching youth fast-pitch softball. How old were you when you knew you wanted to be a scientist? I think my interest in science dates to early childhood. I remember being especially fascinated with cleaning the fish after successful fishing trips. My dad is a physicist, and as a youngster I really enjoyed the playthings available in his lab--liquid nitrogen, dry ice, lasers, calculators, and computers. Did particular teachers inspire you? I have been fortunate to have great teachers at every stage of my education. Dave Grant, my advisor at Davidson College, introduced me to the idea of doing biology research all day, every day, during a semester at the Duke Marine Laboratory. His stories of being a marine biologist in Woods Hole, Massachusetts, definitely inspired my future career choices, and I later followed in his footsteps as a postdoc at the Woods Hole Oceanographic Institution. Mark Hahn, my postdoc mentor there, has been hugely influential, both scientifically and in his kind and gentlemanly approach to his students and colleagues. How does a teaching-centered college like Kenyon support scientific research, especially work that involves students? Kenyon does a great job facilitating faculty-student scholarship. The lab facilities in the Fischman Wing of Higley Hall have been a boon to my undergraduate research program. Start-up funds are crucial for beginning faculty establishing a new lab group, and in recent years Kenyon has a strong record of providing the financial resources necessary for new faculty to establish lab courses using the most modern methods and to become competitive in raising research funds from granting agencies. The Summer Science Scholars Program provides a highly visible entry point for students to join lab groups. Kenyon prizes student research and refuses to recognize the artificial division between teaching and scholarship. This philosophy provides an important foundation for student-faculty collaboration, not as a special arrangement but as a way of life. Scientific research is by nature a group activity that depends on the efforts of students, so this approach has enabled many Kenyon scientists to be successful scholars. You've taught in Kenya as well as at Kenyon, taking time after college to teach science in a village school. How was that experience valuable? I've always been glad I took the opportunity to try an adventure before my life became more complicated. As an advisor, I regularly counsel my students to think carefully before they squander their youth on rapid career advancement. I left Kenya with a deep respect for the role of a school as the force for economic development in a local area. A strong village school not only provided the sole educational opportunity for local kids, it could also serve as the impetus to get roads paved, safe water sources established, maybe even electricity provided. Students who attended the school had better job opportunities. Young women who stayed in school often delayed their first pregnancies and had fewer children overall. A village school created opportunities in a very direct way, and it was great to be involved in that process. Do you like the rural character of Gambier? Perhaps rural life is an acquired taste. I acquired it by living in a large city, Atlanta, for several years. I like the lack of traffic and the sense of community that small-town life brings. Having grown up in an academic community, I'm comfortably raising my kids as "fac brats," but I'm also glad that in the public schools they're able to have friends from families outside the college community, especially farm kids. Do you have any "guilty pleasures" or nonscientific indulgences? I like fly fishing, canoe paddling, and camping trips. Visits to my home in Tennessee and to my wife's family in Florida provide great opportunities for these hobbies. My most unscientific indulgence is reading cowboy novels, like Louis L'Amour books. It's a pleasure, but I don't feel guilty about it.